Are You Suffering from an Overweight Mattress? Mattresses seem to be getting bigger and bigger and bedding sizes haven’t been following suit. If you have a pillow top mattress you know how hard it is to find store bought bedding that covers the sides of your enormous mattress and box spring. Recently I was drooling over the website of one of my favorite architects John B. Murray and came across this beautiful bedroom. 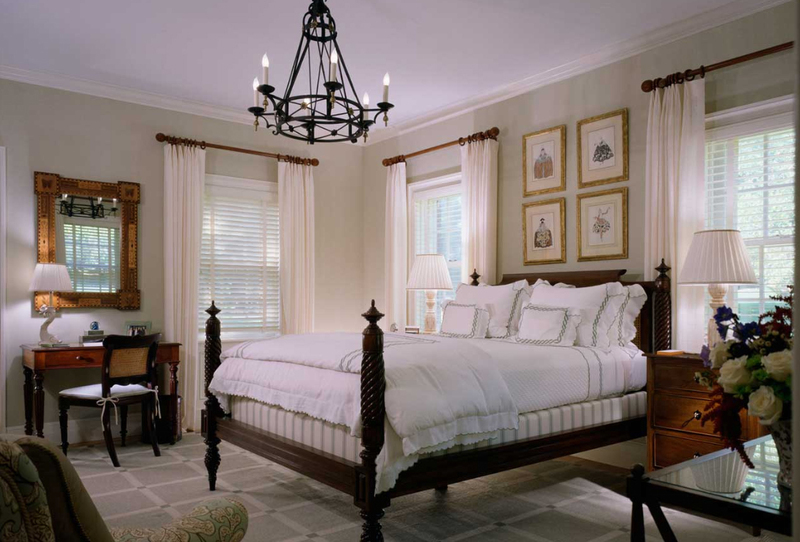 The shallow bed frame left most of the box spring exposed and rather than selecting bedding that will hang over the box spring, the designers opted to use a box springs cover in a coordinating ticking stripe. The sheets and mattelasse are tucked completely in between the mattress and box spring and the bedspread is folded nicely at the foot of the bed. It creates a really clean and tailored look that I bet would be pretty easy to make each morning. This same idea could be recreated pretty easily and solve the “my bedding is too short to cover my ginormous mattress and box spring” problem. 1 Response to Are You Suffering from an Overweight Mattress? Did you see my post on my ginormous mattress? It was humorous. I solved our problem by taking the slats out of our bed frame and placing a queen sized metal frame underneath. Your pic is a fantastic solution to the problem!